Silicon Studio and sdtech has Collaborated on Providing Development Environment of 2D/3D Human Machine Interface (HMI) for SoC “R-Car” for Renesas’ on-board Information System. We are happy to announce that Silicon Studio and sdtech have reached an agreement to collaborate on providing development environment of 2D/3D human machine interface (HMI) for SoC “R-Car” for Renesas’ onboard information system. sdtech’s Data Analysis Tool “TRITO® Comperio” has been Adopted by Fujitsu Ten for Development of Driving Assist Service using Vehicle Data. We are happy to announce that sdtech’s data analysis tool “TRITO®” Comperio” has been adopted by Fujitsu Ten for development of driving assist service for drivers using vehicle data. We thank all the visitors for taking their time to visit our booth at “Automotive Engineering Exposition 2017 Yokohama”, held at PACIFICO YOKOHAMA, from Wednesday, May 24 through Friday, May 26, 2017. The exhibition was a great success for sdtech and gave us the opportunity to showcase all our successful services and products, which generated a great interest. The following were demos shown at the event. A Simulator demo which the drivers’ state (stress level) is continuously monitored as to pupil, line of sight, heart rate, and CAN data, to reflect HMI style suitable for each driver. A tool set for efficient HMI development from the upstream processes to the mass production development. Workable on design tools commonly used by designers and engineers. A VR cockpit demo that allows to verify and evaluate usability of HMI developed with “Linkage” within the VR environment. Standard Corp. (subsidiary of XING Inc.) Adopted TRITO Video Effect (a video codec library), for a Trial Operation of a Store-Linked Promotion Ads. We are happy to announce that TRITO Video Effect, a video codec library for producing GUI, has been adopted for store-linked campaign notification service that is in a test run by Standard Corporation, a retailing subsidiary of XING Inc.
We will be exhibiting at “Automotive Engineering Exhibition 2017”, at PACIFICO YOKOHAMA in Yokohama, for three days from Wednesday, May 24 through Friday, May 26, 2017. We will show demonstrations using a driving simulator, in which the drivers’ driving consciousness is judged using “TRITO Comperio” and HMI is modified in real time based on the result. In addition, we will exhibit “TRITO Linkage”, an HMI development tool which corresponds to VR for the first time. A New Screen Transition Feature “Screen State” is Now Available for TRITO Linkage as an Option. We are happy to announce the release of “Screen State,” an optional feature to “TRITO Linkage” launched in January 2017, which allows users to create screen transitions. Now, it becomes possible to create screen transitions that is linked to GUI screen developed with TRITO Linkage without coding. This further allows users to efficiently develop GUI and to prevent screen transitions from missing to be added to GUI. * “ZIPC Designer” is a registered product of CATS CO.,LTD. Hirotaka Suzuki, CTO of sdtech, will give a presentation on the theme of "HMI development technology in the era of automatic driving" at BIZ Shinjuku on February 15 and 22, 2017. Hirotaka Suzuki, CTO of sdtech, will give a presentation on the theme of “HMI development technology in the era of automatic driving: Efficiently developing high-quality HMI using human-centered design, design engineering, and machine learning” hosted by Technological Media Center at BIZ Shinjuku on February 15 and 22, 2017. Haruhiko Urokohara, the chair of U’eyes Design for which Suzuki is one of the directors, will also give a presentation at this event. sdtech will collaborate with ACCESS Co., Ltd. (“ACCESS”) which leads the network software market. ACCESS’s mobile software has been implemented on more than 1.5 billion devices, and its network software has been used by more than 300 telecommunication device manufactures. By packaging ACCESS’s browser technology and sdtech’s HMI development tool, we jointly provide solutions which increase the efficiency of IVI development. For details, see the press release. 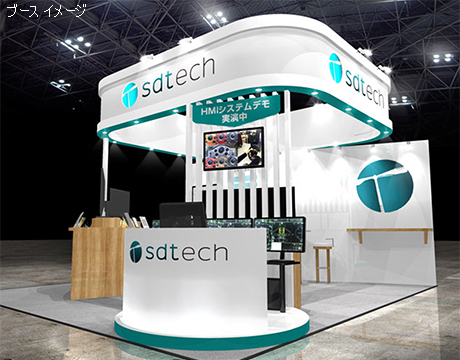 Thank you for visiting sdtech booth at "Automotive World 2017 / Connected Car EXPO"
We exhibited at “Automotive World 2017 / Connected Car EXPO,” held for three days from Wednesday, January 18 through Friday, January 20, 2017 at Tokyo Big Sight. We presented collaborative demonstrations with our partners focusing on our products launched in January 2017 during the event. We are very pleased and thankful to have many visitors attending the event. We also thank our partners for collaborative exhibition. sdtech is Releasing TRITO® Series, Products that Had Been Under Development Since its Founding Today. Today, we are excited to announce the release of products which we have been developing since the company was founded in 1995. With the release, we are confident that our mission to “develop products that will be appreciated for many years to come” will make a leap forward. Below are TRITO® series officially released on January 18, 2017. We will be showing demonstrations at “Automotive World 2017 / Connected Car EXPO” held at Tokyo Big Sight from January 18 through 20. We hope you will take this opportunity to visit our booth to view our demonstrations.